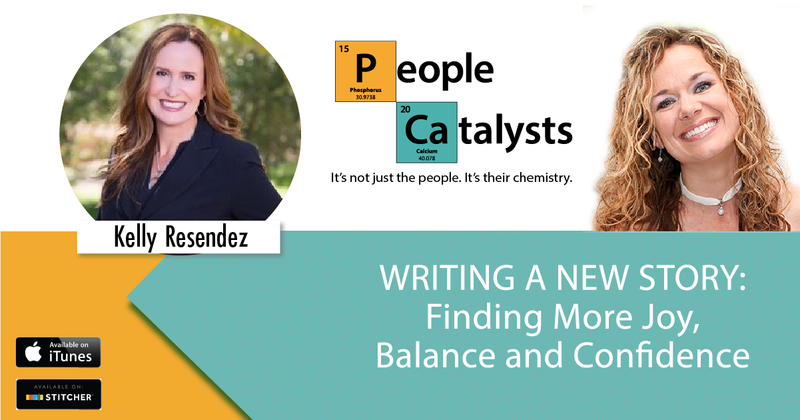 Don’t miss this episode of The People Catalysts Podcast where we have an energetic chat with special guest, Kelly Resendez. On the People Catalysts Podcast We consistently discuss our relationships with our team, clients and promoters. However, today we are going to hit the rewind button and discuss our relationship with ourselves. Kelly is the Executive Vice President Paramount Partners Group the retail channel of Paramount Equity Mortgage. Paramount has closed more than $27 billion in loans and is licensed in 48 states. Kelly is also the Founder of Big Voices Rise, where their mission is to positively impact the lives of women by providing the tools and knowledge to think and respond differently. Karla Nelson: Welcome to The People Catalysts Podcast, Kelly Resendez. Kelly Resendez: Good morning, Karla. Karla Nelson: Good morning, Kelly. How are you today? Kelly Resendez: I’m actually a little cold, not quite ready for winter but I’m definitely excited to be here with you and your listeners. Karla Nelson: Yes. It’s sweater weather, for sure. It’s here. It came all of a sudden though didn’t it? Kelly Resendez: It did. It’s crazy because you and I live in the same area. So we’re both experiencing it. Karla Nelson: Yes. It was sometimes after the blistering summers of California, especially Northern California. It’s interesting how it seems like the switch just gets flipped and it’s time to wear sweaters, which I love. It’s awesome. It’s awesome. Karla Nelson: Well, we’re so excited to have you on the show today and as you know, in The People Catalyst Podcast, we frequently speak about your relationships with your teams, your clients and those that promote and refer you. I’m really excited to have you on today so that we can talk about really a relationship, I think, we skip frequently and it’s funny because I always say that between the team and the client, right? Everybody in marketing wants to talk about the client. I’m like, “Hey, if you don’t have the dynamics of your team together, it’s challenging to move to the client.” But today we’re going to rewind even a little bit more and we’re going to be talking about our relationship with our self. And so with that, Kelly, if you could just take some time to … How did you get into this work that you’ve been doing with Big Voices? Kelly Resendez: I would tell you that it’s just a combination of life experiences that led me to a place of realizing that I really wasn’t living an authentic life. I realized in the early 2000s that I was a perfectionist and constantly seeking significance and approval of other people, and I really just didn’t have that deep knowing or trust that I was on the right path. It started me down a journey of self discovery where I had to reconnect with myself and realize that, that’s really the basis of all the success and joy that we have in our lives, is just how we view ourselves and really getting to that place where I truly believe that I’m a masterpiece and for some people, that might be uncomfortable. We’re afraid to really be out loud about our confidence or self-love but I can tell that when you get to that place, it changes every relationship that you’ll ever have in your entire life, whether it’s business, personal, etc. and so it’s so important. For me, the journey just went through learning from a ton of different wise teachers that were out there trying different things, putting more intention and focus on it so that I could connect on a deeper level with my purpose. Karla Nelson: Oh, I love that. And you reminded me, of course, I’m a recovering mortgage broker, by the way. At 20, that was my first company, was working as a mortgage broker. I got my license when I was 20 and I had a mentor and it was Brian Buffini and you’ll know this names simply because … I mean, but this is when he first started out. Now, oh my gosh, I saw how many people are going to his events. Kelly Resendez: You brought up some amazing points there but Brian Buffini was actually one of my greatest mentors as well. Karla Nelson: Oh, that’s awesome. Kelly Resendez: Yeah. So, Brian, I connected with him in 1998 and he was the first person that opened this store of, “Wow, personal growth and development is an important piece of the mortgage industry.” I’m an executive in the mortgage industry as well as a writer and speaker, and so he is really the one that encouraged me to focus a little bit more on who I was being and that’s really lost a lot of times, whether it’s in leadership training or achievement world, success training is really just to focus on who you’re being and how you’re experiencing what your life looks like. And so what I would tell somebody that hasn’t put a lot of emphasis on who you’re being is just to stop and take some time and really just assess where you are and look at how you’re experiencing life. Are you filled with joy? Optimism? Just faith, trust in a deep knowing that you’re experiencing life with the maximum amount of joy, or are you really burnt out, or you really not feeling great about your job, your relationship, the quality of health? Whatever it may be. Karla Nelson: No. Really, Kelly? Kelly Resendez: … when it comes to our emotional intelligence. Karla Nelson: I like what you’re talking about. Kelly Resendez: Yeah. So I just say, look at the area that’s going to be most important. So if you look in the mirror or you show up every day filled with confidence and self-love, maybe that’s not an area that you need to focus on. But if you have that voice in your head that says things like, “What are you doing, stupid. This is never going to work. We’re going to fail. How’s this going to feel?” Then you want to focus a little bit more time and energy on it. Where for somebody else on focusing on who you’re being, maybe they need to become more patient. Maybe they need to manage their time better. Maybe they really need to focus on being detached so that they’re not in a constant state of disappointment or manage emotional trigger. So you have to choose which area you believe is going to have the biggest impact on your relationship with self because if we’re emotionally triggered, that’s where shame comes in because most of us are in a state where we’re going to react and hurt other people rather than respond and take the higher road. Karla Nelson: Amazing how teenagers will bring that goal out in you. Kelly Resendez: Yeah. With their 13-year-old self. Kelly Resendez: So giving them space and honoring that part of them so that I can get them through that is a big piece of what I do. Karla Nelson: That’s awesome. Brian was my first really big mentor, I’ve had several in my lifetime. You reminded me of another thing that he taught me and probably many, many others, including yourself as he always said, “You’ll dramatically overestimate what you can accomplish in a year and you’ll dramatically underestimate what you can accomplish in a decade” and what you’re talking about there is just eating the elephant one bite at a time. It’s like if in one year, you can chisel down the being more present then you’ve got a whole year to practice it. I mean, my goodness, look, it’s almost Christmas again. Karla Nelson: We think a year is so long sometimes, but actually, with the dizziness that goes on, it’s a quite short. So do you have any strategies associated with this as far as how often you revisit it, or what you do in the morning, or just routines associated with being able to plan that process out? Because I think that’s a big part of why a lot of people don’t do it is just that it is that being intentional. It’s almost like if you write your goals down and put them away, it’s incredible how, just by writing them down, they become a big part of your intention and your subconsciousness. So are there some strategies that …? Kelly Resendez: Absolutely. Absolutely. So being in this space for 20 years, and I would say the goal planning and an achiever space for that long, and then not really getting into my spiritual stride for years after that, I’ve tried everything. One of the things that I had to do in the early 2000s because I kept sharing this information, I kept sharing strategies with other people and the truth is, in the moment, it sounded really great and wanted to make life changes and commitments and then a week goes by, two weeks go by and their humanness steps in and all of a sudden, they just aren’t actualizing their potential. And so, I went back and studied neuroscience and psychology to really understand, “How do we do the things that we know we should be doing when we don’t feel like it?” And that’s really the secret. Karla Nelson: I love that. I’m writing that down. “How do we do the things that we know we want to do, but we don’t feel like doing them?” That’s fantastic! Kelly Resendez: Yeah. So I, being a speaker in the real estate and mortgage industry, it was just a struggle because I just have people come in and I just say the same things over and over, so that really is the secret. And so the secret started with figuring out how to get myself to do those things. I have a couple of strategies that I’m going to share with you today, but the absolute vision and mindset that I have for my life is the start of it all. So the strategies don’t work unless I have the mindset and the disciplines that get me onto this path. So my morning ritual, I am faith based so it starts with some faith based practices but then I review my mindset. Who I want to be. I have some contrast that I look at every single day and the top one is nobody steals my joy. Karla Nelson: Love that. Love that. Kelly Resendez: And I’ve got to stay in that seat because it just reminds me that I have choice. I have choice on how I’m going to respond to different situations throughout the day and then I review my goals every single morning. And so again I’ve done it all. I’ve done the vision boards. I’ve done goal planning where I do it once a year. I’ve done it all and I can tell you that the recipe that I have today has been the most impactful that I’ve ever had. So I do my goals quarterly, I review them daily, I’m not unwilling to cross something out or move forward. If I’m not moving toward something pretty quickly then I just really have questions like is this really a priority to me right now and I’m willing just to cross it off and take it off of the list. And then on a weekly basis I set two big goals for myself that I put celebrations and consequences around. So it’s that simple. And it really just is every single day I embody it. I journal every single day. So if I need help. That’s the one piece that I would tell you will also change your life is that when you have a vision and goals written down but then you actually write down exactly the help that you’re gonna need in order to be able to achieve them. And for me Karla like you it’s all about connections. And so you’re one of those items that I asked for help is I need help connecting with other amazing like minded women that want to change the quality of how we experience life. And boom somebody emails an introduction to the two of us. Karla Nelson: I love the energy around what you just said. I mean you could just feel the intention about it and they’re little things. Karla Nelson: I think that’s the most incredible piece is that how long does this actually take out of your day. But it’s setting the intention to note. It’s like if a ship doesn’t know where it’s going out of the harbor then it’s just going to kind of wander around because it has no intention and just setting the sail and I also love what you said there about crossing things off because as a people catalyst we have an assessment and it breaks down what part of work are you great at. So we’re rewinding today and looking at the individual however the object of the exercise in any business scenario is to get something done and it really has got me thinking about how movers, shakers, provers and makers have a different relationship with themselves because they’re going to write their goals differently and they’re going to be focused on different things. Their internal conversations with themselves are going to be different. And you can even overlay this with a personality profile, something like this. But having you said quarterly goals, read the goals daily and then weekly have two big goals that you have celebrations and consequences with in journal. I mean those are like … it’s so easy to do but yet it’s so easy not to do. And then I also love how you said who am I going to need. So your mentors and your colleagues and you can almost always reach out to anybody that has been there that will help you. Which I find this fascinating with connections. Kelly, it’s how we got connected too, through an incredible mutual friend who has been on our podcast as well, Dr. John Jackson who is one of the best leadership trainers I’ve ever met. And one of the things is when you set that intention it’s incredible how things just show up. However it’s because it’s what you’re looking for. So there’s actually a term for that. It’s almost like when you’re pregnant everybody’s pregnant, when you just bought a red car all you see is the same red car everywhere. There’s an actual … Go ahead. Kelly Resendez: There’s neuroscience so that’s our reticular activator. Karla Nelson: That’s it. Thank you. Kelly Resendez: So there’s a combination between neuroscience and then just straight blocks for our ability to manifesting. So it’s a combination of both. I believe in neuroscience. I believe that our brain works a certain way but then I also believe that as human beings that we often block the flow of success and love in our own lives because we’re unwilling to become vulnerable. And asking for help, really being able to ask for help is not easy for most people. And so you talked about these four different types of people that we work with or lead. And the challenge is since an early age those four people have been compared to one another. Karla Nelson: Oh and they’re so different. Kelly Resendez: Yes and we’re so different. Karla Nelson: Oh my God, you just gave me goosebumps. Kelly Resendez: And so we create, yeah we create different stories around that like “Well I should be doing my goals this way or I should be doing it that way” and it’s like no just do what works for you and quit peeking at the person’s paper behind you to see if you’re right. Because right is authentic and you have deep intuition that will tell you when you’re on the right path. And so it’s not one size fits all. Karla Nelson: I love that. That is so critical. It’s so critical individually, so critical on our team, so critical when we’re working with our clients. Everyone’s different. We have a mantra at the People Catalyst. It’s super simple. People are different. Kelly Resendez: Oh that’s a part of our brain that I would tell people that you have to accept. So we have this thing that we do that’s called rumination which is just absolute focus our attention on one thing and it’s never positive, like it’s just never positive. And we just have to accept that part of our brain and we can learn how to be so conscious that it just becomes something that’s operating in the background. Now I wish I could teach you how to make the disempowering thoughts or voices go away. I spent 15 years trying to figure it out myself. And now I teach people how to learn to live with it and just be able to discern how those different thoughts and emotions show up in your life. But the rumination is what really gets us focused on the negativity. Karla Nelson: Well that’s almost … We were obviously tracking on the same path there because I was going to bring up with the four types of core natures of work. There’s actually another one, it’s a oner, 1 percent of the population that 100 percent of the work is made for. But the provers in our model based off the law of diffusion of innovations they typically, provers are later adopters and they’re thinkers. And so they’re the first ones to say what’s gonna go wrong, what’s wrong with it, poking all the holes in it. And that individual is often really demonized for their skills so they call him Eeyore, they call them “you’re such a naysayer, you’re such a downer” but truly they feel like it’s their job to warn you of all of the stuff that could go wrong. We’ll think about that. That is an incredible strength. You can kill an idea or concept or whatever it is you’re trying to do in a concept form. You didn’t spend any money, you didn’t take any time on it and you can make it so much better. But oftentimes when we train that individual has never been like unleashed because we focus on what somebody is not instead of what they are. And then you look at somebody like a shaker who’s diabolically opposite which is a way early adopter and then we look at them and go “oh squirrel, you got shiny object syndrome.” Oh “your head’s in the clouds.” “You’re such a dreamer.” But they can think of like 50 different ideas all of a sudden at once. And they can respond. And so I love what you’re saying about having the relationship with ourselves, understanding who we are and then figure out what combinations of this works for you based off of who you are instead of checking out somebody, I love checking out the person’s paper next to you and trying to do what worked for them because just because it worked for somebody else doesn’t mean that it works for you. So do you have some resources that our listeners could look at in regards to trying out these different things? Karla Nelson: So for me what I found Kelly is that reading my goals daily actually was a little bit of a stress for me because I would do it every day but then when I didn’t do it it was like “oh my gosh. I could be sent to the principal’s office.” And so it was a little stressful for me. So instead what I did is I created a document that has my goals on them but then it also has my checklist for my best day if I got these things done. So for me it came out in a checklist form and then I write my affirmations on my bathroom mirror. So then it’s like well I already have to brush my teeth and do everything. So I just kind of instead of intentionally reading them I by default like have them on the mirror and just like you this has been a good 15 to 20 years of diving down into what worked, what didn’t work and then getting back on the bicycle when I fell off. I can’t even tell you how many times I’ve had to come back and go “OK let’s regroup. I got too far out. I ate too much junk during Christmas. Got to get back to working and out and getting to the gym.” So where can listeners kind of identify some of those ideas and strategies that they can try out for themselves? Kelly Resendez: So first and foremost when you’re looking at goals you have to figure out what your dominant energy is. So people that have dominant feminine energy can’t do goals the same way that an achiever with masculine energy does them. So even though I’m very dominant and I’m driven and I’m definitely somebody that has a lot of I would say power in business, I’m very feminine. So my goals are centered around connection and are centered around feelings which often can’t have tangible results that are associated with them. So where somebody else might have their goals of like “OK I’m gonna make this amount of calls by this date and I’m going to do these different things.” So I kind of have a combination. So you want to do your goals that are in alignment with who you really are. So that’s first and foremost because goals aren’t supposed to stress you out. It’s about creating a vision for yourself and I always tell people probably the most impactful exercise that you can do is take yourself out 20 years and look at the person that you will become 20 years from now. And if you had achieved your goals what will they say. And if you never took any action towards them what will they say. Karla Nelson: I like that. Kelly Resendez: And really just feel what that feels like. Because I know that my 64 year old self is going to be very grateful that I’ve prioritized my emotional and physical well-being before anything else. And I know that. And I also know that they’re going to be grateful that I’ve made a decision to have financial freedom in my life and I’m taking the steps necessary to do that. But if I wasn’t that person’s gonna be like “We’re never gonna be able to stop working and we’re having a hard time getting off the couch right now because you didn’t take care of us 20 years ago.” So that’s super impactful. But some of the strategies that I would tell you that kind of line up with what we’ve talked about today is, you know, my self sabotage strategy is one in which you really figure out what your preferred method of self sabotage is for yourself, and you’re able to document it and come up with a plan that when it shows up, that you’re prepared to be able to take it on. Because when we’re exhausted and when we’re overwhelmed, and when we don’t have capacity, our self sabotage that’s always affected us our whole life, is really what’s gonna take over. Karla Nelson: It’s the 400 emails that got sent out, and the one person that sends you something back. Karla Nelson: Happy. Some part of it. Karla Nelson: And they’re like, a typo for goodness sakes. Kelly Resendez: Yeah. Exactly. And then the other one that I really recommend, and when you talked about these unique different types of people that we have an opportunity to work with, this helps leaders. And it’s my trigger management strategy. And what it does is it allows us to really look at all the emotional triggers because I know, I’m rolling out something big right now at my company, and I have one of those people that was like, I’m afraid this. Like, what if this? Every worst case scenario, but because I manage my emotional triggers, I just said, “thank you for telling me all of the unintended consequences of this decision that I may have missed along the way. I appreciate that. But here’s what I’ve done to already anticipate each and every one of those scenarios.” And gave her back the confidence that she needed to know that I was making the right decision for the organization. So, when you figure out what your emotional triggers are, and they’re so much, like they’re just the same things that happen over and over and over again. You know, our emotional triggers are just like you’ve gotta name ’em. You’ve gotta understand what preference the trigger’s not in alignment with. ‘Cause deeply, my preference is that everybody things every idea that I’ve ever had is the best idea in the entire world, right? That’s my deep preference. And then step three is just realizing what my hallucination is. My hallucination is, if somebody disagrees with me, it means that I’m the stupidest person in the entire world. So our frontal lobe goes worst case scenario, best case scenario, and so I beat it to its punch. Instead of letting it go rogue on me, I’m like, no, I’m gonna write down the absolute worst case scenario of this emotional trigger happening. And then I choose. Do I grow through this? Or do I avoid it? You know I could avoid it. I could fire every person with that personality type. It’s not gonna give me a well rounded organization. But I could. Karla Nelson: Everyone we assess, and we’ve got several we’re assessing right now, they’re always heavy in one area. Karla Nelson: You’re a natural leader and appreciating the differences. Many times it’s against, you know, that’s not necessarily where people lean. They lean towards, oh, you like my idea, you like me. Right? And they want you to accept every single idea versus allowing the person that’s gonna poke all the holes into it. Right? And letting them have a say in that piece. And by the way, that’s the person that as soon as you make them feel comfortable, they’re gonna be your greatest ally on your team. Karla Nelson: They are so loyal to it after you show them, hey thank you. These are all the things that are gonna go wrong. Look, these are all the things that we’ve identified that we’re gonna make sure that we mitigate the potential risk. Right? Kelly Resendez: Yes. But it’s taken a devotion towards developing my own emotional intelligence and confidence to be able to become that. And that’s really where we have to realize, assessing and knowing is like, you’ve gotta do those things, but you also have to be so confident in who you are and how you show up, that these people aren’t gonna steal your joy. ‘Cause that’s normally what happens, right? If somebody disagrees with you, in a nano second, your ego kicks in. It steals your joy. You react. And then you’re like, I’m gonna fire ’em. Kelly Resendez: At like 10:05 you were totally good, and at 10:11 now, you’re off the rails. And now you’re like, I can’t wait to go to happy hour tonight and down six margaritas so that I don’t have to deal with this. Karla Nelson: Well, you know what Kelly, I think this is a precipice, what you’re talking about is really how work is changing. Because think about it, when we were say, even our first job at 16 or whatever, we were always told just do what you’re told. And it’s really shifted, and the mindset has shifted. I mean, we used to go to school and do all projects and never have a team project, ever, right? Now, that’s completely different. You’re constantly having to realize that you need to work with a team. It’s not just head down, you were told to do this and listen to what I say. And what we call that is, we’re shifting from function management, which is your title, or your ability to say this is where I sit, and role management, which is, this is the thing I’m best at, so let me do based off whatever work we’re doing, let me do what I’m best at. And I think that is significantly shifting in the workplace today, which we’ve been on both sides of it where you just listen to what you’re told because that’s what the boss said. Or that’s what the owner said, or that’s what the manager said, to, hey, how do we collaborate? How do we identify the differences here with everybody? And then utilize the team in its most efficient and effective way? And I think that’s shifting. Karla Nelson: It’s 70%. And I just looked up a Gallup poll today, it’s insane. Karla Nelson: I subscribed to Gallup and they’re constantly doing these polls. And it’s 89% of people hate their jobs internationally. 70% in the U.S. And this is not dislike, this is not not happy with, this is H-Hate their job. 70%. Over 51% are looking for a new job right now. 51% of people employed in the U.S. do not like their job and are constantly looking to go somewhere else. I mean the stats are staggering. And I agree with you on the consciousness piece. People are asking themselves, and it’s probably because, I mean, Maslow’s law of hierarchy too, is the fact that we’re not worried about eating anymore. So, okay, let’s go up on the scale. We’re not worried about you know, a safe place to live, so let’s go up on the scale, right. So our consciousness about ourselves is where we’re being left with. And then our relationships with others. And I’m also a faith based person, so relationships, I mean, there’s a reason the ten commandments were, either our relationship with a higher power, or our relationship with other people. Karla Nelson: That’s the one thing all ten of ’em have in common. Karla Nelson: And I’m so happy that you joined us today. This has just been an incredible podcast. I’ve taken three pages of notes here today Kelly, ’cause I’m constantly trying to learn from others and if there’s anything that you’d like to leave us with, or any last comments or thoughts? Kelly Resendez: Absolutely. So you can find me on my website at bigvoicesrise.com. You can purchase my book, Big Voices, on there, that talks a lot about the strategies that I talked about today, along with resources that are gonna help you write a new story. You’ve got tons of free stuff on there for you. And also, a new training course that just launched. It’s a video series that really just goes into, again, just changing the way that you either experience your life, or changing your life. For some people that you know, maybe that want a new job, that want a new relationship. It’s a great program for you. And really, Karla, what I wanna leave everyone with is, you can create whatever possibility for your life that you could ever imagine, but it starts with having that decision that you are that powerful. And we really truly are. And I’ve been blessed to be here with you today, and share with everyone, and I just hope that you’ve taken away, just, if I put a little bit more focus on who I’m being, the results that I’m gonna have within my team, within my company are gonna be off the charts. Karla Nelson: Excellent. Kelly, thank you so much for being with us here today. Kelly Resendez. And again that website, bigvoicesrise.com.